For the last 10 years my general sleep pattern usually consisted of going to bed sometime between 12:00 A.M. and 1:00 A.M (sometimes later) and waking sometime between 7:45 and 8:00 A.M. When I awoke usually the first thing I’d do was grab my cellphone to check emails and text messages in bed. I get a lot of emails from international customers and I was interested to see what opportunities were percolating worldwide. Then I would roll out of bed and do my bathroom stuff (often skipping the shower to save time). I’d throw on some clothes, skip breakfast (I would usually eat some oatmeal when I got to the office) and head to work at about 8:20 A.M. In the last two months I’ve changed my morning and evening patterns during the work week because I’m trying to get more productivity out of each day and hopefully lead a more fulfilling life. I make myself turn the lights out sometime between 11:00 and 11:30 P.M. I keep my cellphone in the bathroom with the door open, as opposed to keeping it on my nightstand. That way I can hear it if someone is calling with an emergency late at night, but I won’t be tempted to check it if a foreign customer sends me a text message at 3:00 A.M. In my new morning ritual I wake up at 7:00 A.M. sharp everyday. 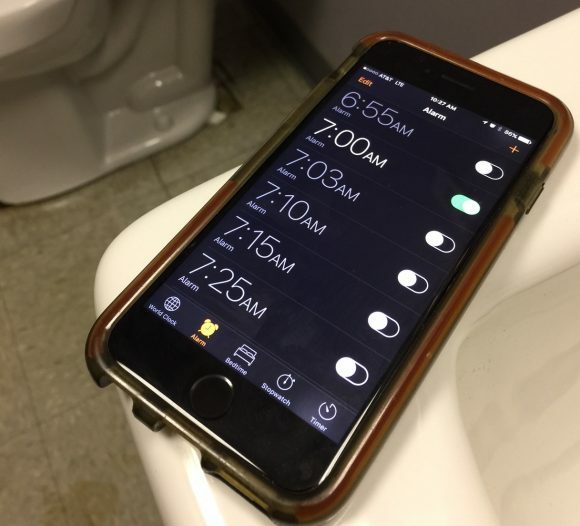 The snooze alarm and checking email in bed is prevented by the phone being in the bathroom. I jump out of bed immediately to turn off the alarm on my phone and amble into the shower which revives me. I also find that a shower often triggers my brain activity. I start coming up with new ideas and plotting what I need to accomplish the coming day. After showering I eat some eggs while the phone still remains in the bathroom off limits. I spend five to ten minutes listing in a notebook all of the tasks I want to accomplish that day. Then I spend approximately 15 minutes writing down 10 new ideas. The ideas can range from new inventions to new types of businesses. Perhaps I’ll make a list of ways I can get out of my comfort zone or 10 things I feel gratitude for. Not until after I’m done writing down my ideas do I get to check emails or texts. If I don’t get to lay out my day’s plan and write down my 10 ideas the day feels out of balance. My new goal is to go to bed even earlier so I can wake up earlier and get more sleep. Scientific studies show that peak brain performance occurs in the first few hours of the day. Scientists also say that if a person receives eight hours of sleep he has the potential to be three times as creative as he would with less sleep. Also, when I read about famous high achievers it seems like most of them average eight to ten hours of sleep. My problem is that time feels so scarce. I feel like I already don’t have the time to do all the things I want to do after work such as working out, cooking dinner, spending time with my girlfriend or working on creative projects. How will I have enough time with one less hour in my night. My hope is that when I start getting more sleep and waking up earlier my new found efficiency will give me a net gain for my day’s productivity. Question 1: What is your morning ritual? Question 2: Are you an early riser or night owl? That is a great accomplishment. I am a pawn of my evil phone as well and my routine is similar. Be careful you don’t let the coming holidays knock you off the wagon, it can easily happen. I actually sometimes sleep next to my phone on the weekend. I like to be a little more leisurely then. But I plan to start waking up earlier on a Saturday or Sunday to accomplish things I don’t have time for the rest of the week. Amount of sleep merits strategery. My day starts before 4am, and rarely do I stop before 10pm; I’m mostly tired. I eat well, though. I wake up by feeding the dog and cooking a “food” breakfast, either salmon with veggies; cod with onions/mushrooms and some cream in the skillet at the end (amazing); or bacon and eggs, plus coffee. 25min later I’m at the table reading my Bible and eating like a gourmet. Saturday’s reading is whatever else I’m in, currently Churchill’s abridged version of his WW2 work. Noah, you opened the box… Sounds like you have “owners kid spoiled brat disease”. While not terminal it can be a drain on others in your work enviroment.To be clear I am not a morning person, but with 2 kids under 2 and meetings that start at 8am, my morning routine has to start a lot earlier than yours. Chores in the morning iinclude feeding the cows, sheep, dog, putting wood in the outdoor stove, and plowing out 2 -5 driveways before dropping kids off at daycare. Its called adulting or “growing up” go ask some production people about I am sure they can fill in more of the details for you. Maybe you can write a blog about it sometime. Really dude? That was unnecessary. Lighten up Josh. I’m not picking on Noah specifiaclly. I can appreciate Noah’s struggle with phone addiction, but I am sick and tired of being told to treat the newbies like they are all something special. Heck of a lot of people out there that have real struggles to deal with. You want some perpective? I gave you mine. You don’t have to agree with it. I am sure Noah can appreciate that.